As a child, back-to-school tends to be something of a bummer — good-bye camp, hello again homework. For parents, it’s a joy, something Staples famously captured in its “It’s the Most Wonderful Time of the Year” commercials. In the marketing world, back-to-school email campaigns may not be the same juggernaut as holidays, but ‘tis still the season to drive conversions. Let Persado’s insights from 2017 back-to-school email marketing campaigns be your cheat sheet for overachieving this year. Alert! Alert! Anxiety draws consumers’ attentions to the importance of a message. 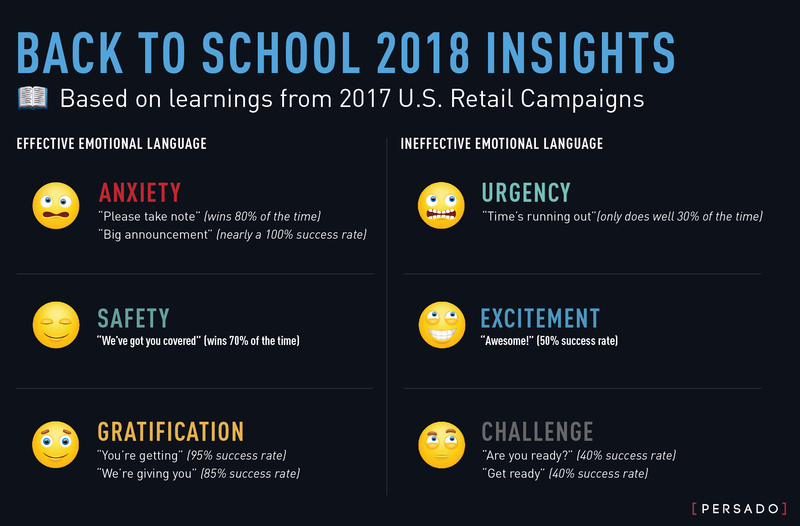 A trending emotion, Anxiety dethroned Achievement (think “You Earned It!”) as the top driver of email campaign engagement across North America in 2017 and was clutch in delivering strong back-to-school email marketing campaigns. When marketers use Safety-driven language in campaigns, they are speaking to consumers’ fears and helping them feel secure. Safety is a proven winner for marketers in back-to-school email subject lines. Perhaps it’s because — deep down — parents might get a bit anxious about making sure their child(ren) are well-prepared for the year ahead and it serves brands well to comfort them. Regardless of the reasons, it tends to work and is worth trying out. This emotion got gold stars in last year’s back-to-school email marketing campaigns. Gratitude expresses knowledge, appreciation or affection in a personal way. A fall-back for marketers, Urgency doesn’t typically make the grade in email campaigns. The emotion warns about pending deadlines on things like promotions or limited-edition products, but consumers aren’t fans of due dates when it comes to shopping. Leave those to teachers. Though some people may be pumped about back to school, this emotion is another underachiever. Excitement introduces something with enthusiasm or delivers positive news — guess we’ll have to leave this one to the cheer squad, not the marketing department. Classes can be challenging, but turns out, utilizing this emotion in back-to-school email marketing likely won’t get the job done. This type of language provokes a decision or action by asking questions or daring consumers.